Kittilä Airport is a small and idyllic airport in Finland, with several daily flights from Helsinki-Vantaa Airport. Kittilä is actually the first contact with Lapland for hundreds of foreign travelers arriving to admire the natural wonders of the North. The location of the airport is great, as it is only 17 km away from our first tourist destination, the Levi ski resort! There are also several car rental companies at Kittilä airport (eg Avis, Hertz, Europcar, Sixt and FiRent) to get your car for the upcoming road trip. Levi is one of the most popular ski resorts in Finland, which provides great facilities for an active holiday in winter. 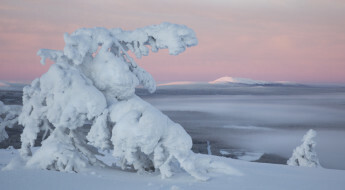 The winter season is the best time to enjoy the frosty sceneries of Levi, because snow is almost always guaranteed. Don’t also forget the many events that are organized in Levi! The biggest winter event in Levi, the Alpine Skiing World Cup, is famous for its international atmosphere. 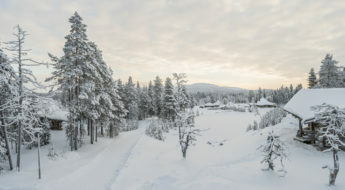 The numerous rental cottages and holiday homes give you a chance to spend a perfect holiday in Finnish Lapland. Check out the large range of accommodation and find a perfect cottage to suit all your needs! Once the Levi ski resort has become familiar, it’s time to continue the journey towards the next destination. The ski resort of Ylläs, which is 65 kilometers and about an hour’s drive away from Levi, is also among the most interesting winter destinations in Finland. Ylläs has actually the largest network of ski trails in Finland (330 km), the longest slopes, and many interesting activities for everyone. When visiting Ylläs, you can participate in different safaris (e.g. snowmobile, reindeer and husky safaris) or rent equipment and try snowshoeing yourself. If you are not afraid of cold water, you even have a chance to try winter swimming in an icy lake! Find a perfect cottage for your holiday in Ylläs, Finland. After spending a day or two in Ylläs, it is time to continue the journey again. It takes about 4.5 hours to drive the distance from Ylläs to Ruka, but do not worry – there’s plenty to see along the way! If you are traveling through Rovaniemi, you can go to greet Santa Claus and explore the whole Santa Claus village in the Arctic Circle. 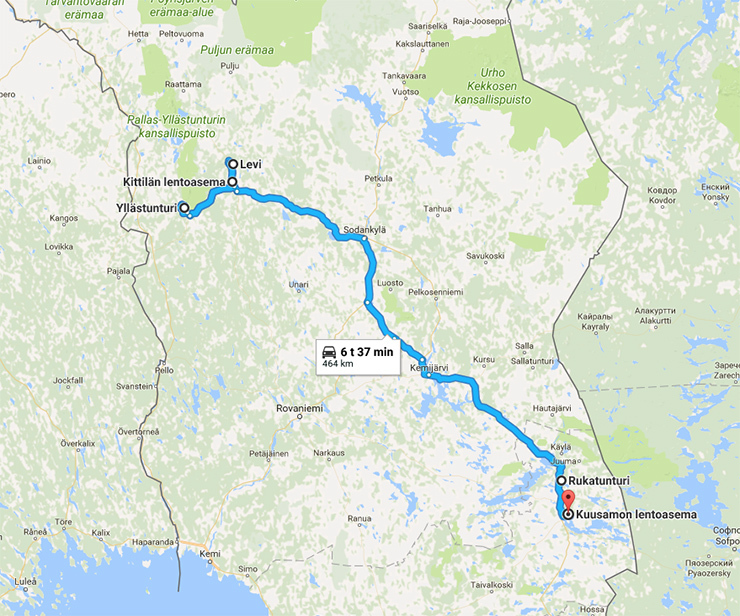 Alternatively, you can drive through Sodankylä and Kemijärvi, where the Pyhä-Luosto tourism center is a potential pit-stop along the way. After arriving in Ruka, you can stay in an atmospheric cottage or even book a ski-inn accommodation in the center of the village. 5. Until Next Time, Finland! When it is time to say goodbye to Finnish Lapland, you can start your road trip from Kuusamo airport, which has several daily flights to the capital of Helsinki. The airport is located only 32 km away from Ruka, so you can enjoy the wonderful winter landscapes even on the day of departure. Whether you are interested in sporty activities, exotic travel services or the local culture, Lapland is full of opportunities! Explore the rental cottages Gofinland website and start planning your journey in Finland!